Who would have thought that two zoos, would make a significant contribution to a closer relationship between Germany and Myanmar? We are referring to Rangoon (today Yangon) Zoo, formerly known as Victoria Memorial Park and Zoological Gardens, and Tierpark Hagenbeck in Hamburg. In 1901 the British initiated the construction of a zoo in the heart of Yangon, on the banks of Kandawgi Lake. The main attraction at the opening was the white elephant belonging to King Thibaw, the last king of Burma. In 1907, a German animal dealer named Adolf Ernst Max Patzert settled in Rangoon. This marked the beginning of the German connection to Rangoon Zoo, as Patzert was working for both the Tierpark Hagenbeck and the zoo in Rangoon. His business was based in Insein, today a district of Yangon, where he also operated a private zoo. In 1913, however, he renounced his German citizenship. 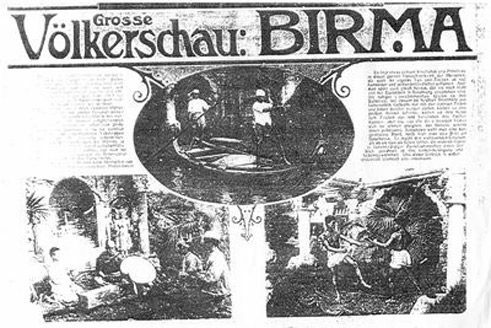 In the same year a so-called “Völkerschau” (roughly: folklore show) with 50 Burmese actors took place at Tierpark Hagenbeck. In such a “Völkerschau”, people from foreign cultures, sometimes together with their local flora and fauna, were presented to the public. While today such displays would be viewed critically, Tierpark Hagenbeck did make a serious attempt to take these exhibitions beyond mere sensationalism and to encourage authentic encounters with various cultures. Thus a variety of traditional handicrafts, dances and the Burmese martial art Leth Way were presented. A replica of the Kyaiktiyo Pagoda served as backdrop. In addition, a leaflet was distributed which included the names of the performers and an explanation of the performances. Birmanische Völkerschau | © Hans Bernd Zöllner This particular “Völkerschau” is also connected with a very different kind of cultural exchange. In 1914 a child was born in Hamburg, the result of a liaison between one of the Burmese women and a German man – probably the first German-Burmese child to be born in Germany. The rise of the National Socialist Party in the 1930s marked the end of “Völkerschau” in Germany. The presentation of foreign and exotic cultures did not fit so well with the ideology of the National Socialists. After the outbreak of the Second World War, Max Patzert was spared imprisonment in an internment camp because of his British citizenship. Thus he was initially able to continue working freely. Before the Japanese invasion in 1942, Patzert was instrumental in the evacuation and rescue of several of the animals in the zoo. During the Japanese occupation from 1942, Patzert claimed to be a German citizen, and so was able to continue working as director of the zoo under Japanese rule. The occupation, however, presented a significant danger to Patzert. In 1944 the Japanese ordered him to leave his home. When shortly thereafter he failed to appear at work, his assistant went to his home, where he discovered Patzert’s body and that of his daughter. Patzert had shot first his children and then himself. No trace of his wife was ever found. 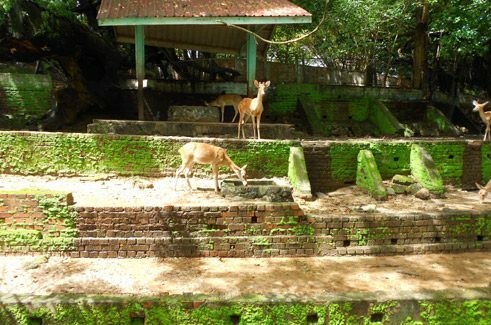 But the zoo, while sustaining damage, survived World War II and all subsequent conflicts and continues to exist to this day. And events can still be observed there that make it special. The late American humorist Evan Esar once wrote, “The Zoo: An excellent place to study the habits of human beings” and that aptly describes the zoo in Yangon. The lake in the park is a favourite meeting place for young couples to escape the strict watchfulness of their parents and, hand in hand, dreamily gaze over the water. And even on a rainy Sunday in August, at the peak of the monsoon season, the zoo is full of visitors. Often three generations of a family are out together – the children running ahead excitedly, their parents and grandparents tagging along behind. Animals in the zoo in Yangon | Photo: Florian Frank © Goethe-Institut e.V./Myanmar Adding to the special atmosphere of the zoo are the numerous buildings from colonial times, such as the tiger enclosure. Crumbling, moss-covered old brick walls contribute to a somewhat mystical atmosphere. 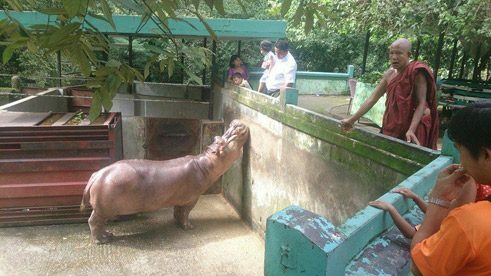 Visitors are quickly brought back to the here and now by the opportunity to feed many of the animals, such as hippos and bears, for a fee of 500 kyat (about 50 cents) - an offer that is eagerly accepted not only by the younger visitors. Do you have any questions on this article? Please write us!